Frankfurt New West, a low-and-moderate income family suburb abutting Vancouver, British Columbia, is becoming ground zero for new policies to prevent gentrification and displacement in Canada, and perhaps globally with the passage of its latest city bylaw. With housing prices averaging over $1 million in Vancouver every city and town within commuting distance is a battleground between developers, landlords, and tenants trying to stay in their homes and close to work and families. Not surprisingly, New West is also an ACORN redoubt and the longtime location of ACORN Canada’s office in British Columbia. Several years ago, ACORN, working with the city council had won the first living wage ordinance in Canada. Indexed to inflation, the hourly wage there is helping sustain working families and is still the standard nationally even as other cities like Toronto have followed suit. New West, Burnaby, and other Vancouver suburbs has been free-fire zones for what are known as “demovictions.” In those cases, long term tenants are being evicted when smaller units are demolished and new higher rise apartment and/or condo complexes replace previously affordable housing alternatives for our families. As families are priced out of Vancouver, the fight with developers over their strategies has been intense. The New West council, led by longtime ACORN ally, Jamie McEvoy, passed with our support a measure that penalizes “renovictions.” Renovictions are the process of evicting tenants by jacking up rents past affordability for renovations, rather than demolitions. The new bylaw would fine landlords $1000 per day if they either evict someone without proper notice or do not give them the right to return to their apartment at the same rent level as they paid before the renovation. Additionally, New West would vacate the landlord’s license to rent in the city as well, if they are using renovictions to cast off tenants. This action in New West would be a powerful tool to prevent displacement with real teeth. Landlords and their friends are obviously crying like stuck pigs and claiming this will mean that landlords will lose any incentive to improve their apartments. Many of these renovations are simply long overdue upgrades that tenants have also demanded and what would normally be expected would be a landlord’s responsibility to provide habitable units in return for the rent being paid, making renovictions and minor improvements simply a guise for huge rent increases. Obviously, the fight is not over to maintain affordability and decent standards in New West, and we have certainly not heard the last from developers and landlords. In the meantime, ACORN Canada is going into hyperdrive to get information about this new tool on the agenda for city councils in Ottawa, Toronto, and other communities where displacement and gentrification are going full stream. Go ye and do likewise! Please enjoy Extra-Ordinary by Lost Leaders. Thanks to KABF. 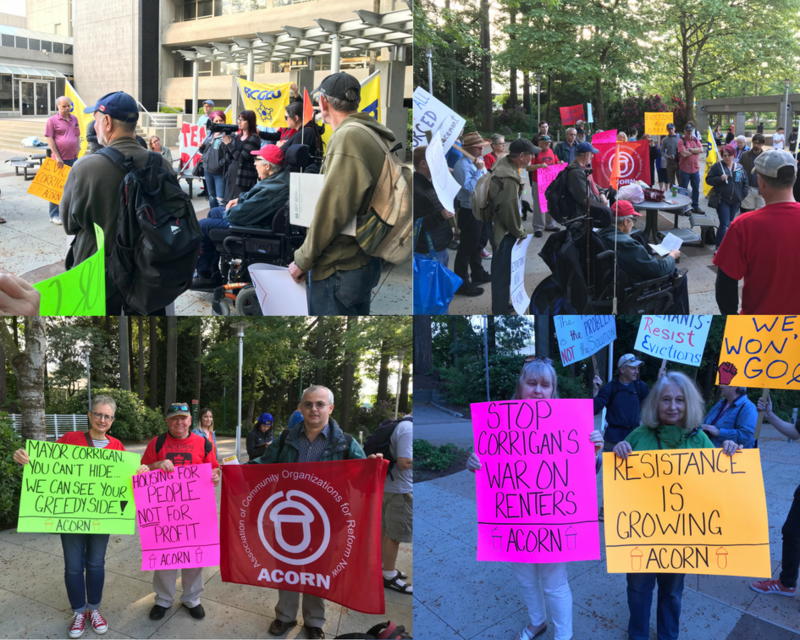 This entry was posted in Ideas and Issues and tagged ACORN Canada, affordable housing, Burnaby, demovictions, evictions, New West, renovictions, vancouver by Wade. Bookmark the permalink.